The Avision AV50F Plus is the perfect companion for the office, on the road, or at home. Designed with portability in mind, AV50F Plus features an innovative detachable ADF module, which allows you to leave the ADF dock at the office, and take the slim and lightweight scan module anywhere with you. Measuring only 29.7 x 8 x 6 cm and weighing a mere 1 kg, you can pack it easily alongside your laptop or slip in a briefcase. The standalone module requires only a USB port for power, eliminating the need to find a wall socket. Imagine scanning all of your documents, receipts, photos, business or id cards (up to 1.25mm thick) no matter where you are, wherever you go! For batch scanning operation, simply reattach the scan module to the ADF docking station, and enjoy 20 page capacity with 15ppm / 30ipm scanning speed at 200 dpi in color mode. The scan module can be easily and conveniently detached and work as a mobile scanner. With a high optical resolution of 600 dpi and advanced image processing technology, you can be assured documents can be converted in the highest image quality. 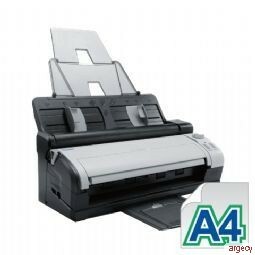 With an addition of a 20-page auto document feeder, the AV50F is able to scan document continuously without interruption. Allows you to scan thicker paper up to 1.25mm including business cards or embossed plastic cards such as credit cards with its straight paper path. Directly drag scanned image or text and drop to your email or documents.